Lesslie Newbigin’s book, Foolishness to the Greeks, changed my life. I don’t remember a lot of the specifics, but by reading this book I came to realize that I was looking at the world through some very thick and tinted lenses. Everyone looks at the world through the metaphorical spectacles of a worldview. There are competing worldviews in the West, by which I mean Europe and North America. One of the dominant ones has been around for a while–the Modern story. This may be in the process of being replaced by the newer “Post-Modern” story. Another worldview that has been around much longer is derived from the Bible. Although very different, we in the West look at the world through a weird blend of all three. 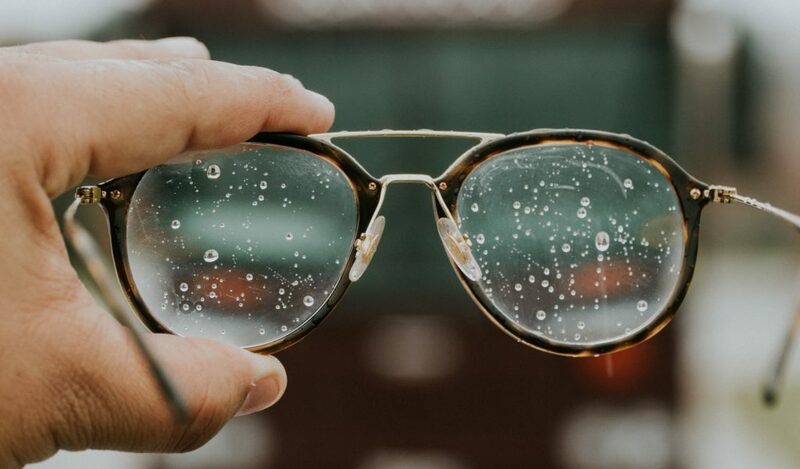 If you are going to understand the glasses through which you are view yourself and the world, you need to begin by understanding the basic characteristics of each worldview which is tinting the lenses by which you look at everything. In our culture, all our glasses are being strongly tinted by modernism. The roots of the Modern worldview are in the 18th century, the Enlightenment. While it took some pretty big hits in the 20th century, many of the ideas which characterize this perspective are with us today. Human reason is the source of truth; the light, in Enlightenment, is Reason. Francis Bacon and Rene Descartes really got this idea going and it has stuck with us. They trusted in reason to be the arbiter of truth (Read “Fact versus Truth“) albeit from different starting points. Bacon used reason to take him from observation of particular phenomenon to universal principles, and Descartes saw the human mind as the final authority in understanding reality. Although they approached it from different angles, both trusted reason to lead to the truth. Reality is material. There is nothing that transcends the material world, or, if there is, it has no relevance to one’s life. In other words, there is no such thing as the supernatural, only the natural. This idea is called materialism or naturalism. If human reason is the source of truth, then Bacon’s approach, called empiricism, will help us to discover the truth. This only works in the natural world, but since nothing else is real, there is no problem. The individual is of primary importance. In the modern worldview, human reason is autonomous. So also is the individual whose motto has become, “You’re not the boss of me!” Our history is one of emancipation from those who would curb our independence: kings and queens, God and the church, communism and socialism, and tradition and social conventions. Our free economies and liberal democracies are testaments to our individual autonomy. One source of this idea is Rene Descartes whose “I think therefore I am” not only grounded truth in the reason but in the reason of the individual. Faith in Progress. 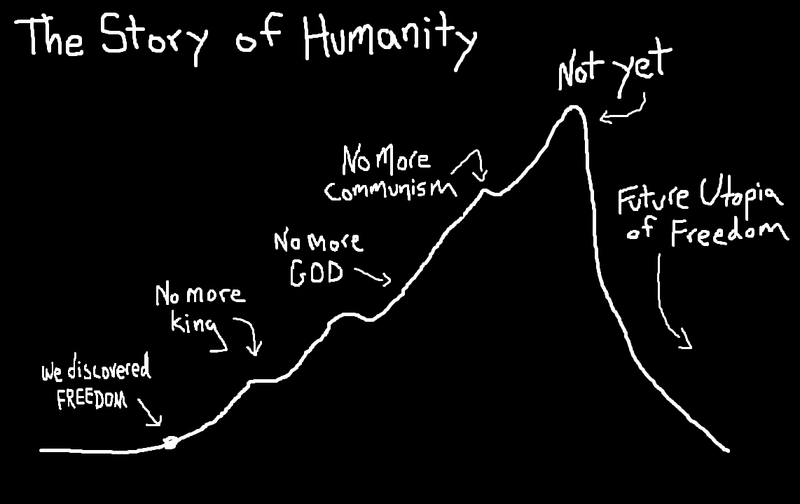 Humanity is on an upward trajectory. Because of human reason and its offspring, science and technology, Modernity places a lot of faith in progress. It has long believed that we need to get rid of silly superstitions and religious beliefs. Reason rather than religion will allow the human race to continue up the road toward perfection and science and technology will solve the problems that we face. Categories and more categories. Because human reason is only autonomous if the world is only material, the modern mind establishes and defends boundaries between categories. There are many. Here are a few: mind/body, natural/supernatural, material/spiritual, immanent/transcendent, public/private, rational/emotional, fact/value, reason/faith, knowledge/belief, sacred/secular and objective/subjective. The Biblical worldview differs significantly with the Modern worldview on each of these points. Human reason is part of God’s good creation, but it has also been distorted by sin, so it cannot be completely trusted. 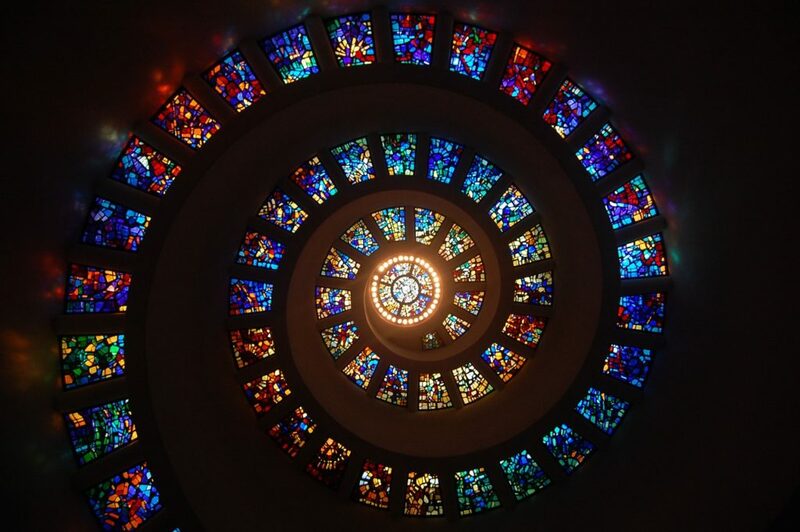 Obviously, the Biblical worldview is not materialist or naturalist because it proclaims a transcendent God who is the source of objective realities like The Good, The True and The Beautiful. The communal nature of God as Father, Son and Holy Spirit challenges the idea that those created in the image of the triune God ought to be understood first as an autonomous individual. God’s Grace and not man’s ability will be the cause of any progress we experience in this world, and that’s only if we surrender to Christ because he’s the only one that can deal with our real problem–SIN. Christ, who is wholly God, became wholly human and yet did not surrender any of his divinity; this alone presents a challenge to the clean categories so loved by the Modern mind. An honest reading of the Bible will blur many of the other boundaries between the other categories held so dear by modernism. The problem is, the Biblical worldview and the modern worldview are not kept distinct. Our glasses are tinted by both of these (and other) contradictory worldviews. The term “Christian worldview” is often used, but not always understood. Too often, people think that if you simply believe the Bible, oppose abortion and avoid R-rated movies you have a Christian worldview. OK, this is a bit of a caricature, but my point is, Christians often have a far too superficial understanding of worldview. Sarah’s story illustrates how even sincere believers may find themselves drawn into a secular worldview–while remaining orthodox in their theological beliefs (32). Although Sarah’s story may illustrate what Pearcy says it does, it does not help readers to understand the depth at which we hold worldviews–Christian, Secular or whatever. Here’s an illustration that I think better illustrates how deeply worldviews are held and the conflict between a Christian and a “Secular” worldview. I’m teaching Grade 9 Humanities this year so I started reading the textbook. I think it’s a standard textbook for Social Studies across the province. I didn’t get beyond the first page and I knew that this year I would be teaching a lot of worldview in my class. Two sentences in the introduction to the first chapter entitled “The Early Modern Age” grabbed my attention. They present a worldview that is completely contrary to a Biblical one. Sometime around the year 1500, Europe began to experience profound changes in its political, religious, social, economic and intellectual life. As a result of these changes, European history began to enter a new era–the Early Modern Age. All civilizations experience a kind of evolutionary change in their histories. Together these sentences suggest that humanity is moving toward a better world and that the Early-Modern Age was a significant step in that direction. Many people in our culture accept this without batting an eye. This is their worldview. And it’s held far more deeply than the idea that reproductive freedom is good or bad or whatever. It is true that there were a lot of changes going on in Europe around the year 1500. It is also true that some things have improved over the last 500 years–transportation, for example, is much faster than it used to be. But is it true to say that our civilization has improved just because some aspects of it has? A survey of the last hundred years–with two World Wars, one Great Depression, the nuclear arms race, ecological disasters, new and deadly diseases–provides a lot of evidence to the contradict the idea that things are getting better. So why does the textbook make this claim? They make it because it is true within a certain story. No claim (or “fact,” thing, event, person) means anything until we place it into a story. This is why human beings always tell stories — we are always seeking meaning. All stories, whether myths or movies, share some common elements. They always have a protagonist, a person who strives for some goal. This quest drives the story toward a meaningful end. Stories also have conflict because there are always antagonists, that is, a person (or people or a force) that impedes the protagonist in the fulfillment of his or her purpose. Two stories concern us here: the so-called “secular” story and the Christian story. In the secular story, the dominant myth in our culture, the protagonist, humanity, is on a long quest for autonomy (freedom from authority). The antagonists in the secular story oppose human freedom. These are monarchs, God and the church, communism, fascism, socialism, tradition and social conventions. Many of these villains and monsters have been vanquished and only a few remain. Because my grade 9 Social Studies textbook has placed the events following 1500 into this Secular story, it can claim that we have experienced evolutionary change in our history. This is the dominant story in our culture, but it isn’t the only one. The Christian story says that humanity will find fulfillment only in the presence of the loving God who made him. Sin and Satan, the antagonists, thwart humanity at every turn, but the hero of the story has come to find us and will bring us home (actually, bring home here). This is the meaningful end of the Christian story. When you consider civilization from this story, change has not been evolutionary–civilization has not improved because we have come no closer to dealing with our basic problem. Freedom, according to this story, is a good thing, but Sin causes us to make GOOD things into ultimate things. This inversion is, in essence, to make Freedom, into a god, a false god, an idol. Freedom is a good thing, but it is not the ultimate thing. The secular story, or worldview, is foundational to my entire grade 9 social studies textbook and most of the other textbooks used in schools all over North America. And it’s not just textbooks; it’s the worldview upon which the whole curriculum is built. And it’s not just in schools, this story is reinforced by popular culture. We are inundated with this story, and it is a powerful story. When we consider the people who have fallen away from the church, I don’t doubt that many they left to seek autonomy–they wanted to do what they wanted to do and not have anyone or anything restrict their freedom. This is not necessarily a choice freely made, but one that makes sense because of warming toward the secular story. One’s position on abortion is not a worldview–worldview runs much deeper–but your position on the issue of abortion is dictated by your worldview. So will be your position on other issues that are, at their core, about human freedom. I’m still using that textbook though, because discerning worldviews is one of the objectives of this and every other class taught at my school. I worry for the Christian kids who aren’t in a school that is deliberate about exposing the competing stories in our culture. And I also worry about the kids who are, because the secular story seems so true, because we are immersed in it. I take more than a little comfort in the fact that none of the competing stories ring so true as the one where sin is the antagonist and the end is being reunited with the One who gave us every good thing–including Freedom. In the modern world, we evaluate almost everything against the standard of practicality, utility, and efficiency. I know people who won’t buy a hybrid, because it will take 10 years before the additional cost of a hybrid is recouped through lower fuel consumption. Therefore, it’s simply not practical to buy a hybrid. All other considerations are irrelevant. I have been asked, “What’s the point of a humanities degree? ” It’s not practical to get a degree that won’t get you a job that pays six figures. Unfortunately, this is the reality in a culture that values science, technology, and entertainment. The money goes to these fields while philosophers and literary theorists work at Starbucks. We produce beef, pork, and chicken very efficiently, but we disregard the wellbeing of the animal, the worker, the environment. And the taste doesn’t even factor into the equation. The same principles of efficiency are evidenced by the fact that almost every dress shirt in the major department stores comes from Bangladesh. Practicality, utility, and efficiency are more important than loving our neigbour or being stewards of creation. Whenever something gets preferment over these sacred tasks, we are dealing with an idol. When our culture abandons a relationship with God as the ultimate source of human fulfillment, there are a plethora of other gods to which to turn. One of the options was this petty, but dangerous, god of many names, Practicality, Utility, and Efficiency. Christians are a product of the times. When we build our churches today, we consider practicality, utility, and efficiency. There’s nothing inherently wrong in this, but when it trumps all other considerations? What do we lose when our physical building is primarily designed to, for instance, maximize the amount of seating space? From my seat in the pew at St. Augustine, it is obvious that its builders didn’t care much about the efficient utilization of the interior space. They had a different set of priorities. Perhaps I idealize their motivations, but it seems as if they were attempting to erect sacred structures rather than practical ones. Many churches took generations to complete. The carving of wood and stone clearly had objectives that went far beyond mere utility. 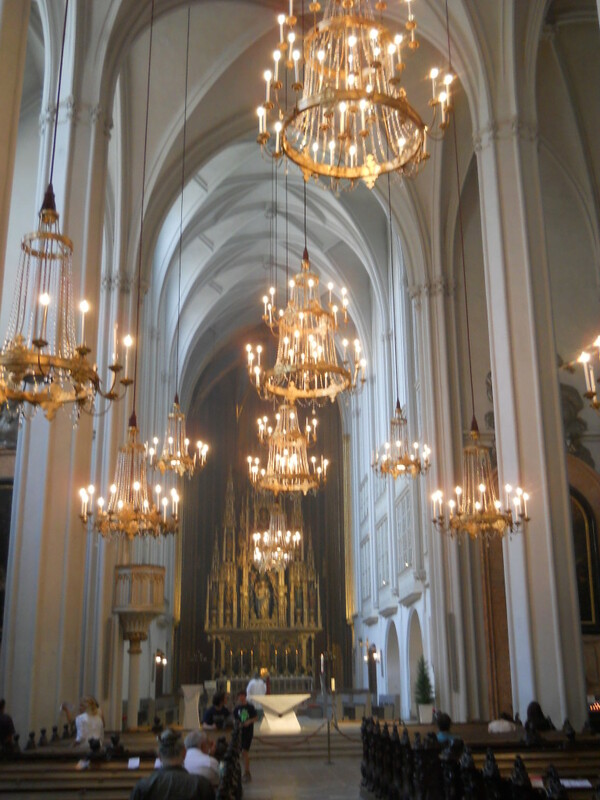 Less than half of the available floor space is used during the service. Surely they could have saved a lot of building expense if the roof wasn’t so high. Although I didn’t understand the sermon because of the language barrier, I did figure out that the sermon was about Mary and Martha. I recalled that Martha complained to Jesus that Mary was ignoring practical concerns like the clearing of dishes. Jesus gently rebuked her and told her, in essence, telling her that some things are more important than utility and efficiency.